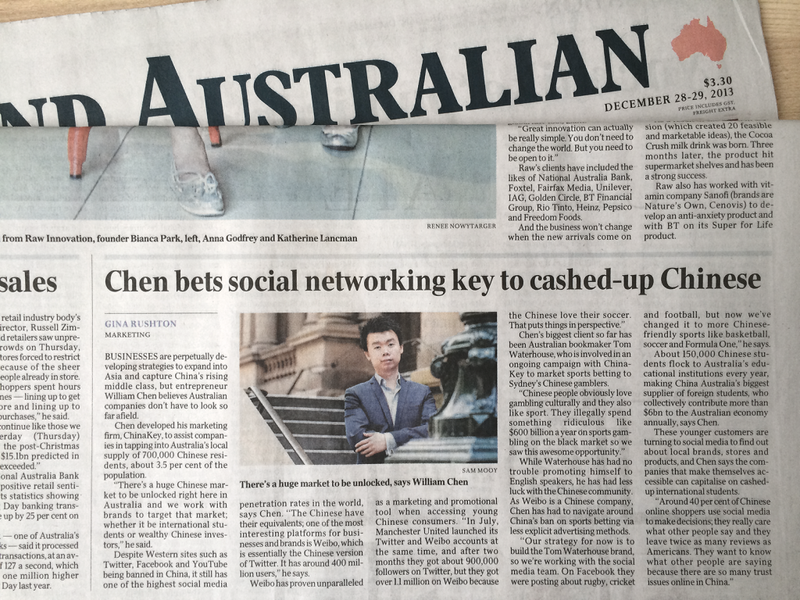 China Key was recently featured in The Australian, here is a summary of the article, hope you guys enjoy. BUSINESSES are perpetually developing strategies to expand into Asia and capture China’s rising middle class, but entrepreneur William Chen believes Australian companies don’t have to look so far afield. Chen developed his marketing firm, ChinaKey, to assist companies in tapping into Australia’s local supply of 700,000 Chinese residents, about 3.5 per cent of the population. “There’s a huge Chinese market to be unlocked right here in Australia and we work with brands to target that market; whether it be international students or wealthy Chinese investors,” he said. Despite Western sites such as Twitter, Facebook and YouTube being banned in China, it still has one of the highest social media penetration rates in the world, says Chen. “The Chinese have their equivalents; one of the most interesting platforms for businesses and brands is Weibo, which is essentially the Chinese version of Twitter. It has around 400 million users,” he says. Chen’s biggest client so far has been Australian bookmaker Tom Waterhouse, who is involved in an ongoing campaign with ChinaKey to market sports betting to Sydney’s Chinese gamblers. While Waterhouse has had no trouble promoting himself to English speakers, he has had less luck with the Chinese community. As Weibo is a Chinese company, Chen has had to navigate around China’s ban on sports betting via less explicit advertising methods. “Our strategy for now is to build the Tom Waterhouse brand, so we’re working with the social media team. On Facebook they were posting about rugby, cricket and football, but now we’ve changed it to more Chinese-friendly sports like basketball, soccer and Formula One,” he says. About 150,000 Chinese students flock to Australia’s educational institutions every year, making China Australia’s biggest supplier of foreign students, who collectively contribute more than $6bn to the Australian economy annually, says Chen. These younger customers are turning to social media to find out about local brands, stores and products, and Chen says the companies that make themselves accessible can capitalise on cashed-up international students.